As a teenager, or even an adult, we enjoy reading fictional books because it opens our mind into a different universe or even timeline. We can picture ourselves in that amazing and unique world that it’s begging us to stay and to never leave that place. Alas, like all great things they must come to an end. Once we put our book down, we have to return to our boring reality but sometimes that’s not the case. There are readers in this world that can take their favourite fictional stories and make it into a reality. Take Lord of The Rings for example. There’s actually a real life hobbit house in New Zealand that we can actually spend a night or two! Even a world with combination of Victorian and Steam Locomotive? That’s right, the steampunk world. A world of decadence and science which we can actually make it as a DIY decor by recycling used metal items. Ever thought that we could substitute our wooden shelves with pipes? Well in the steampunk world they surely can! By just fixing a few pipes on the wall, we have our vey own pipe shelves that we can place our wondrous books into it. Remember those big gears that we sometime find lying around at a big open field? Grab it and make it into a table top! Just add screw a long pipe onto a base and place the gear on top of it with a flat surface glass. It’s so vintage looking. We know to have lights is obviously essential for our house because we need light to actually see anything. But we don’t want to have those conventional lights design as it’s so boring. By so, let’s fix a few pipes, add some wiring and mounted on the wall. 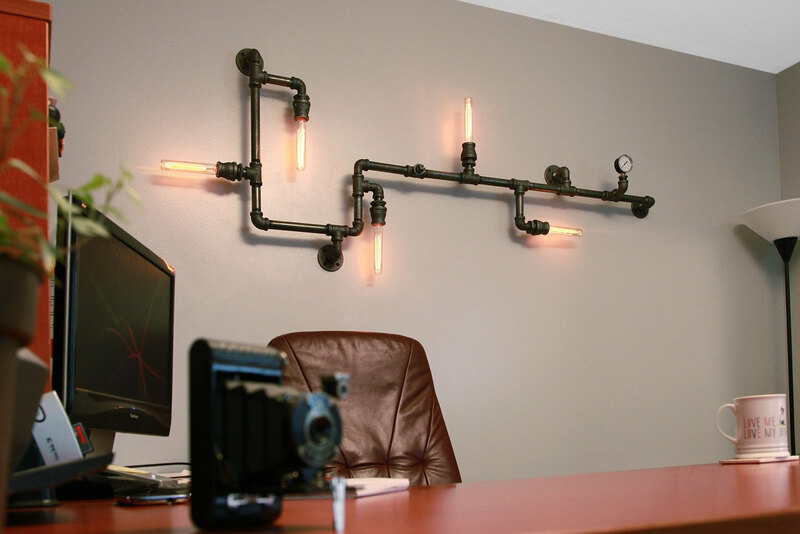 Switch on the lights and we’ll an awesome pipe lights. If we’re not keen on making a few “steamy” furnitures, perhaps we can make a simple one like a painting wall art. 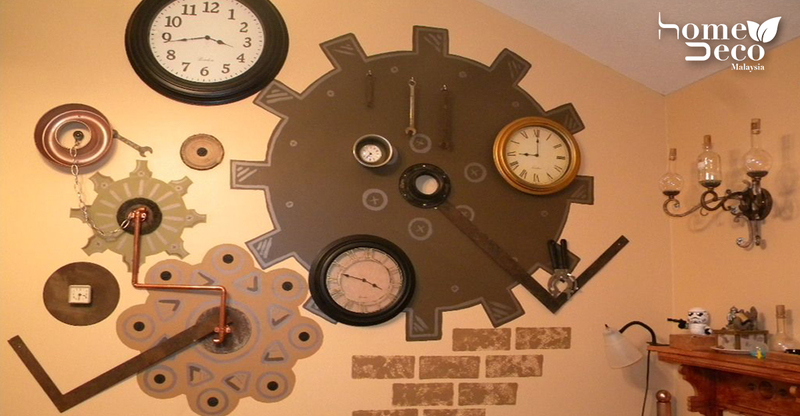 Well, in this case a steampunk wall art. Now we can’t end it without a clock with its gears. Why? The clock is the main symbol for steampunk designs!Get a vintage clock, decorate it with some gears and mounted on the wall. Tick-tock it look so cool. The Steampunk world is truly a fascinating and creative place to live in. We’re like living in the past but at the same time there’s a hint of the future.